Acolyte. Wolflight. Genesis. 2015. Hackett Live. His upcoming tour is already casting shadows. 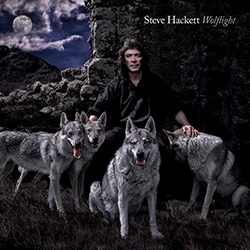 Between 2nd September and Christmas, Steve Hackett and his band will be on tour not only to present his brand new album Wolflight, but also to dig deep into history and de-dust old favorites from both, Genesis and Hackett solo. 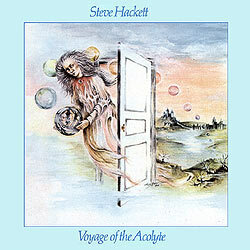 His debut album, Voyage Of The Acolyte, is turning 40 this year. Christian Gerhardts spoke to Steve about everything related to the upcoming tour and found out pretty intersting stuff about what fans can expect. Christian [it]: Hi Steve - I'd like to discuss a few things about the upcoming tour, but first, let's got back a few weeks. You were headliner at this year's Night Of The Prog Festival at the Loreley and I noticed that people were singing along very loudly during the show. It was also the last pure Genesis Revisited show. How did you experience it? 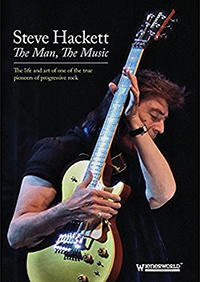 Steve Hackett: It was a very nice show, I enjoyed it very much and it was really good. We had not played it for a longer time. It was a nice atmosphere and Loreley is always a special place to perform. Steve: That's right. He's going to be in the band for the new shows. I'm really looking forward to working with him as part of the band. it: Nick Beggs and Roger King have formed this new band, The Mute Gods, so will you allow Roger some time during your tour to work on his other project? Steve: I think the tour is going to be very busy up until christmas, so I think there's no time, really. I guess after that he might be involved more. I'm not sure about the schedule, but obviously I wish Nick Beggs and Roger the best for this project. it: The tour starts 2nd Sept in Bochum and as of today, it will finish in Mid-December in the USA. Are there any special cities or venues you are looking forward to performing in? Steve: All of them, really I'm looking forward to that. I haven't done Leipzig for a while, I'm looking forward to that. For me it's all quite special. It's one long tour that takes us to America after Europe and the UK. It will keep me pretty busy pretty much until Christmas, I think. it: Are you planning more dates next year or is this tour finished by Christmas? Steve: There might be some more dates next year, there might be Japan, there might be occasional things. But I was thinking about concentrating on recording next year, there are one or two projects. So I am planning that and I will not be doing many shows next year, so really, this will be it for a while, we'll be presenting the material in surround sound and there are a number of songs I have not played for a long time. Icarus Ascending or Star Of Sirius from the early days and further back there will be Can-Utility And The Coastliners, The Cinema Show, The Lamb Lies Down On Broadway, Get'em Out By Friday ... It's really a show of two halfs. The first one will be solo material, the second half will be Genesis stuff. But I will be mixing it. There won't be a half with Genesis stuff only and a half with solo stuff. It will be a mixture to make everybody happy. Steve: I can answer another question for you: We will also be doing about 5 tracks from Wolflight, my latest album. There will also be a retrospective boxset of my early work, called Premonitions. It will have 10 CDs and 4 DVDs with Surround sound mixes, some live concerts which have not been released before in its entirety. That will be pretty extensive. it: You've mentioned Premonitions. Is there a reason why Cured and Highly Strung have not been remixed? Steve: Yes, because we could not find the multitracks for that. Those albums were released by Charisma and they had the multitracks, they may have lost them. Probably it happened when they were moved from Charisma to Virgin, then to EMI, now Universal. The multitracks have not surfaced yet. That's the way the cookie crumbles, but some have been remixed. it: Coming back to the tour - you are now rehearsing. Are you alone with Roger at the moment or is the band complete already? Steve: No, first of all we'll be rehearsing with Roger and Roine, then we'll be rehearsing with the band. It will probably a week with Roine, then with the band. It's different stages. First I rehearse alone, then with Roger and Roine, then with everybody. 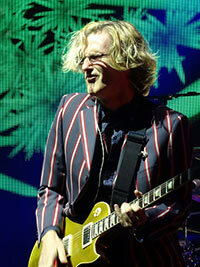 it: Whose idea was it to get Roine Stolt on board? It's looking a bit like an odd decision to have him play bass, since he is a good guitar player. Steve: That's fine. He'll be doing bass and 12 string. He offered to do it. It came from a conversation he had with Nad Sylvan. He's also still on board in order to do the Genesis songs. It was a suggestion that came entirely from the Swedish division and I thought it was a great idea. I also hope he will do some lead stuff with me where we can some of the bass work from the keyboards. We will try and mix it. it: You mentioned half of the show will be Genesis material and half will be solo material. So how long will the set be? It could be a 3 hour set. Steve: It could be, yes. First of all we have to say, it will be something between 2 hours and 2 hours and a half. I don't know yet. We haven't done the solos of the songs yet. it: You mentioned some Genesis tracks that haven't been played during the Genesis Revisited tour. Are you planning any different arrangements or will you stick to the original arrangement? Steve: At the moment we are sticking to the original arrangements because I thing authenticity is the important thing when doing the Genesis stuff. In the main we're sticking with that. We're doing Hairless Heart as well, The Musical Box, Firth Of Fifth - those favorites. If for some reason, we change our minds, I could always turn some pieces into a medley, but I think because I am announcing I will be doing these songs I want to present them in their entirety. When we do Cinema Show, we will probably do Aisle Of Plenty at the end. I think people appreciaty full length versions of the songs rather than edited stuff. That's the plan at the moment. But of course we need to have everybody in the same room to make final decisions. I have to be flexible to a certain degree of course. There will be a rearrangement to Star Of Sirius. I am not intending to do the original version. This rearrangement will be substantially different, but it still captures the spirit of the song. it: Stuff like The Cinema Show or The Lamb Lies Down kind of fade out towards the end, so the question was also meant like what's going to happen with these loose ends. Steve: It's a nice idea to have Aisle Of Plenty at the end but it's not until I have rehearsed with everyone that I make final decisions. It could also be a transition to something. I have to really try it, you can't really nail the last thing down right now, I will allow a bit of spontaneity from everybody. it: I think the original idea for the tour was also to celebrate the anniversary of Voyage Of The Acolyte, which turns 40 this year. it: You mentioned a song like Icarus Ascending. So it the focus of the solo stuff half of the set, besides Wolflight, more on the early albums? Steve: There will be some stuff from Spectral Mornings and Defector also. It's a difficult choice, there's a whole ton of albums. I think I have made more albums than most people so it becomes more and more difficult to make these choices, but to a large degree, songs are also chosen by fans. If fans ask for something, over time, I usually capitulate. For instance, when we did the Revisited shows, after the first year fans were asking for Return Of The Giant Hogweed, so we did that. Some fans were asking for The Knife, so I included that. Really certain setlists are driven by the need to please fans. I always wanted to be a crowd pleaser. I'd rather entertain than educate. it: You said that you have an awful lot of material to include in the set, so is it an option for you to say 'ok, I've got three hours of rehearsed material, so we change the setlist every night'? Steve: That is possible. But until we do the set entirely, we won't really know, but there might be some stuff revolving. There is some contingency for that. But also we've got a new member with the band, whereas the rest of the guys has 4 hours of material. Roine has got a lot of stuff to get together. But if he came and said 'let's do this, I know this number backwards' ... I just have to see what the team is capable of. At the moment there's no point ruling everybody to the ground. I hear what you are saying and it makes perfect sense. The band in total, is capeable of doing that of course. I won't make any promises at this point. I am eager to do these songs which either haven't been done for a long time or have never been performed live. Also the stuff from Wolflight - Out Of The Body, the title track, Loving Sea, The Wheel's Turning and Love Song To A Vampire. it: A new addition will be that Nad Sylvan could sing other stuff than only the Genesis tracks. Any plans to let him sing solo songs and maybe new material from Wolflight? Steve: Nad will sing Icarus Ascending and part of the harmony picture on Star Of Sirius. I heard him sing Icarus Ascending and he sounded really good doing that. He some kind plays the spirit that Richie Havens brought to the original version, which is why we are going to do that. it: And the other stuff will be sung by you and the band? it: Did you think about having Nad sing Wolflight songs? Steve: I do not intend to do that at the moment. I feel that we can do it without that. Nad is very good at singing the Genesis stuff, but I do enjoy singing the other stuff, it's a different kind of approach. It's think it's hard to have this Genesis kind-of-voice mixed with the solo stuff that has a different feel to it. I enjoy singing myself and there are a number of singers in the band. It's exciting to see what they can do as well. Roine has a noce voice also. So it'll be an intersting vocal sound with everybody. Steve: Yes we have the front speakers and four in the rear. I'm looking forward to doing that. As far as I know Genesis never did that. I like the idea to present that stuff in a fully immersive way. it: Are there other show elements, like screens? Steve: Not at the moment, I am not intending to have screens with the show. I am emphasizing the audio aspect. I think that creates another kind of visual. Down the line I might decide to change things and use screens again, but I am interest to see how that works now. it: On your last tour you had several shows with special guests, so did you call Ray Wilson already to invite him to one of the shows? Steve: No I haven't been on the phone to people in recent times. 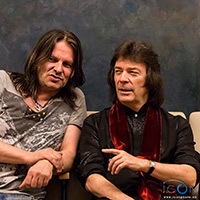 But I very much like to work with Ray Wilson again, I think he's a great singer. I should call him to bring him up at some stage, there were simply many other priorities recently. I have been extremely busy. I will concentrate on the music first, the team is flexible - the musis is the star, as I always say. It's nice to have friends around with the band. I wonder how fans feel about that, who they would like to see guesting. it: Are there any intentions to release a live album from that tour? Steve: I think there will be, the Liverpool show will be recorded and filmed. There will be a DVD from that at some point. But I want to make sure it is mixed by the team that put it together, I don't want to hand it over to someone else. It's too precious for me. I want to make sure that if it's in surround it sounds properly. it: There will be a documentary released during the first week of the tour, called The Man, The Music. What's the story behind that? Steve: Well, Matt Groom of RSK Entertainment has done that. He has been doing interviews since 2010 with me and some of the people I have worked with. I hope when I get back tomorrow I will find the time to watch the rest of it, I am half way through. The story behind that: Matt asked me in 2010. And then it all started. Steven Wilson is in there and some stuff from Chris Squire also. it: I have a review copy and it looks quite interesting. It's nice to have the Chris Squire thing in it as well, obviously an interview with both of you in your house. Steve: Yes, that is really nice. The thing with Chris is ... the last thing he has recorded was the bass for Love Song To A Vampire. It was very nice working with him over the years. it: Earlier you said you want to focus on writing and recording next year. Can you reveal something about these projects? Steve: I don't know yet, might be one project, or two or maybe even three. There will be meetings soon, but I can't reveal anything yet, because I don't want to promise anything that I can't deliver. it: Ok, thanks for taking some time. I will see you in Leipzig and Berlin soon. Steve: Thanks for the nice chat. See you on the road.